Canada and Japan have long been key international partners, both bilaterally and multilaterally. The two countries are vibrant democracies that support open trade, investment and the rules-based international order. Their cooperation internationally spans a range of bodies including: the G7, G20, Asia-Pacific Economic Cooperation, Asian Development Bank, International Monetary Fund, Association of Southeast Asian Nations and the Organisation for Economic Co-operation and Development. The two sides are also committed to enhancing trade relations with the now-ratified Comprehensive and Progressive Agreement for the Trans-Pacific Partnership (CPTPP) trade deal. But while economic ties have long been the focal point of this relationship, it is a critical moment to reassess the need to elevate security and defense relations in order to make a more comprehensive and strategic partnership. Japan’s security environment continues to be laden with concerns—both short and long term—such as continued instability and uncertainty on the Korean peninsula along with meeting the long-term challenge of China. 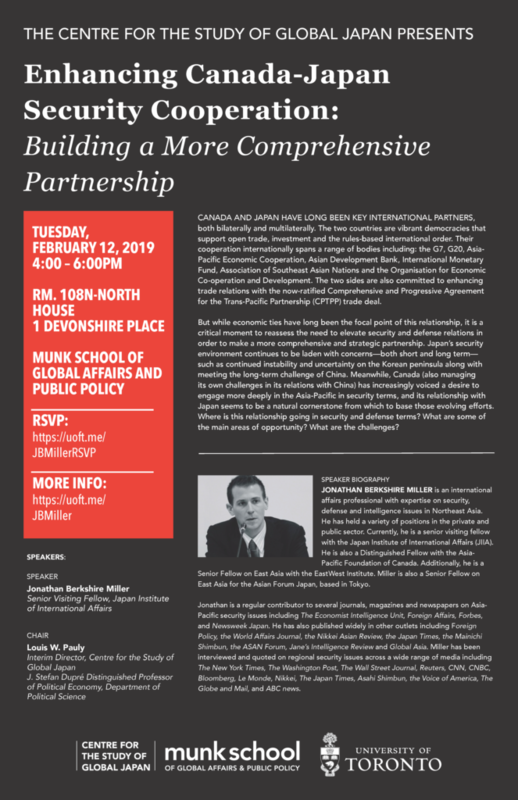 Meanwhile, Canada (also managing its own challenges in its relations with China) has increasingly voiced a desire to engage more deeply in the Asia-Pacific in security terms, and its relationship with Japan seems to be a natural cornerstone from which to base those evolving efforts. Where is this relationship going in security and defense terms? What are some of the main areas of opportunity? What are the challenges? Jonathan Berkshire Miller is an international affairs professional with expertise on security, defense and intelligence issues in Northeast Asia. He has held a variety of positions in the private and public sector. Currently, he is a senior visiting fellow with the Japan Institute of International Affairs (JIIA). He is also a Distinguished Fellow with the Asia-Pacific Foundation of Canada. Additionally, he is a Senior Fellow on East Asia with the EastWest Institute. Miller is also a Senior Fellow on East Asia for the Asian Forum Japan, based in Tokyo. Previously, he was an international affairs fellow with the Council on Foreign Relations, based in Tokyo. Jonathan also held a fellowship on Japan with the Pacific Forum CSIS from 2013-16. At the Pacific Forum CSIS, he chaired a ten-member group focused on Japan-Korea relations, in the context of the US “rebalance” to Asia. Miller has also held a number of other visiting fellowships on Asian security matters, including at JIIA and the National Institute of Defense Studies (Ministry of Defense – Japan). In addition, Miller previously spent nearly a decade working on economic and security issues related to Asia with the Canadian federal government and worked both with the foreign ministry and the security community. He regularly attends track 1.5 and track 2 dialogues in the region and lectures to universities, think-tanks, corporations and others across the Asia-Pacific region on security and defense issues. He also regularly provides advice and presents to multilateral organizations and foreign governments on regional geopolitics. Jonathan is a regular contributor to several journals, magazines and newspapers on Asia-Pacific security issues including The Economist Intelligence Unit, Foreign Affairs, Forbes and Newsweek Japan. He has also published widely in other outlets including Foreign Policy, the World Affairs Journal, the Nikkei Asian Review, the Japan Times, the Mainichi Shimbun, the ASAN Forum, Jane’s Intelligence Review and Global Asia. Miller has been interviewed and quoted on regional security issues across a wide range of media including The New York Times, The Washington Post, The Wall Street Journal, Reuters, CNN, CNBC, Bloomberg, Le Monde, Nikkei, The Japan Times, Asahi Shimbun, the Voice of America, The Globe and Mail and ABC news.